Interested in growing or starting your business? Perhaps an SBA loan is right for you! SBA loan expert Arne Monson of Holtmeyer and Monson will be presenting on how an SBA loan can foster growth in your business. Entrepreneurs, CPAs, and lawyers are encouraged to attend. 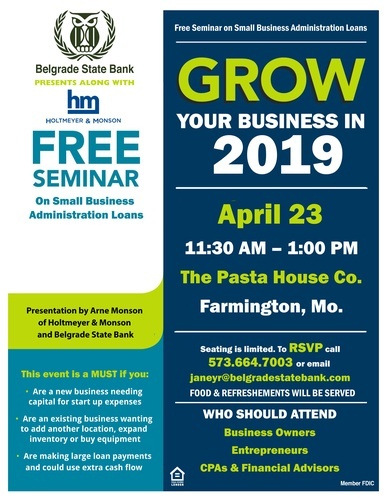 To RSVP, call your local Belgrade State Bank Branch and ask for Small Business Specialist, Janey Radford.